Convert Flash SWF files to videos in AVI, XviD, DivX, MPG, MPEG1, MPEG2, WMV, MP4, 3GP, FLV, MOV, MPEG-4, H264 formats. Optimized SWF to video profiles for many portable and home devices such as iPod, iPhone, Apple TV, PSP, PS3, Mobile phone, Zune, Pocket PC, VCD, SVCD, DVD, etc. Extract and convert Flash SWF file's audio stream to MP3, WAV, WMA, OGG. Record Flash game while you are playing it with SWF converter. The SWF converter has many SWF to video profiles, which help you easily convert your Flash SWF to video playable on iPod, iPhone, Apple TV, PSP, Mobile phone, Zune, Pocket PC, etc. You can also customize the video and audio parameters to produce various video with advanced effect. And you can trim & crop video, add watermark to perfect your video. You'll find more useful features while using iWisoft Flash/SWF to Video Converter. If you are looking for a SWF converter, this one is the best option for you! "I am writing to thank you for something you probably don't even know you've done. You've created a SWF converter that will convert SWF files which other SWF converters cannot do! And the batch conversion mode saves me much time. Many thanks! " - Rick Travis. Canberra, Australia. "I was able to convert Flash SWF to video for so many portable devices with iWisoft Flash/SWF to Video Converter. Now I can enjoy the Flash SWF on my iPod. 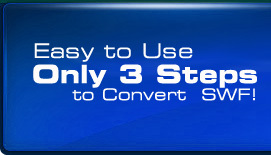 This is the best SWF converter I have used!" - Andes Dahl Eriksen. Auckland, New Zealand. Convert Flash SWF to video in AVI/XVID/DIVX/MS-MPEG4 formats. Convert Flash SWF to video MPEG1, MPEG2, and VCD/SVCD/DVD compatible mpeg file. Convert Flash SWF to video MP4 for iPod/iPhone/Apple TV/PSP/PS3 devices. Convert Flash SWF to video 3GP (3GPP/3GPP2) for most mobile phones. Convert Flash SWF to video WMV for Zune/Pocket PC/Windows Mobile devices. Convert Flash SWF to video Youtube FLV format. Convert Flash SWF to video QuickTime MOV format. Convert Flash SWF to animated GIF or image series, including BMP/PNG/GIF/JPEG format. Extract Flash audio stream to MP3 WAV WMA ACC MP2 OGG formats. Easily clip any segments you favor, and also merge several segments into one. Crop Flash movies freely before you convert Flash SWF to video files. Support adjusting the position, transparent color, and transparency of watermark. Add letterbox for output video to maintain the aspect ratio of the original Flash SWF movie. Built-in Flash swf downloader – download SWF and import it to the SWF converter directly. Optimized SWF to video profiles special for iPod, iPhone, PSP, PS3 and such digital devices. Support customizing output video and audio parameters. Support Drag & Drop swf file from Windows Explorer to the SWF converter. Take a snapshot quickly during playing Flash SWF and save into BMP/JPG/PNG/GIF format. Support changing temporary folder to disk with large free space. Batch SWF to video conversion function. New! How to download Flash (SWF) animations from any webpage? How to convert Flash SWF to AVI video? How to convert Flash SWF to iPod/iPhone video? How to extract SWF audio to MP3 file?